Sally and I spent two weeks in July visiting my Parents in Pittsburgh and touring Washington, D.C..
We left on Friday the 2nd via USAirways on a direct flight. It was an uneventful flight until we got to the airport terminal at the Pittsburgh Airport. As soon as we walked off the plane on the passenger walkway, we were hit by a blast of HOT air. This 90+ heat turned out to be the norm for almost the entire time we were in the east. Fortunately, by the time we got to Washington, the temperature there moderated TO the mid 90's - down from the low 100's. My sister, Patricia, who lives near downtown Pittsburgh picked us up at the airport. The airport is about 16 miles from downtown - something that sounds pretty unreasonable to San Diegans. 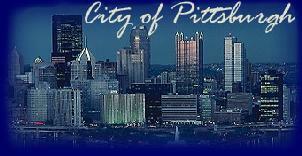 My parents live in Aliquippa which is only about 7 miles from the airport but farther away from Pittsburgh. They still live in the house that my father and his father built in the late forties. It was the house I grew up in. My sister lives in Pittsburgh now but she lived in Arlington, VA for many years - just outside of Washington DC (more on that later). Of course to we Californians, the greenness of the east coast is always a surprise. Even though the east was in the middle of a drought, everything was green! The first day we were there, we were off to a family picnic. It's a cousin of my mother who owns a farm north of Pittsburgh. The heat was really exhausting, it basically ruined what could have been a nice time. But we got a chance to see a bunch of relatives. On Sunday the 4th, we thought about going into Pittsburgh to watch the fireworks but decided the crowds would be too much. They shoot the fireworks from barges that they anchor in the Ohio River right at what they call the Point. That is where the Allegheny and the Monongahila Rivers join to form the Ohio. On Monday, we found a fireworks display in Ambridge, a town right across the Ohio River from Aliquippa. On Tuesday, Sal and I went on a drive into Pittsburgh. Not many tourists around because of the heat. 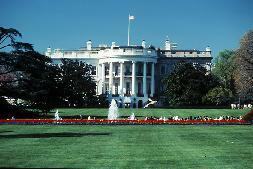 Wednesday, we left for Washington D.C.. We had a nice deal. My sister still owns a Condo in Arlington that she rents out. It had just become empty so we were able to stay there. There was no furniture there so on the way down, we stopped at Patricia's and picked up an air mattress, chairs, a table and kitchen utensils. All in all it made the place liveable. The drive to DC goes over the PA Turnpike to the Breezewood exit and then south on I-70. It usually takes about 4-5 hours. I lived just south of DC, in Springfield, VA for two years when I was in the Army so I still remembered a little of my way around. But after all, that was 25 years ago so I still got lost a few times. On Thursday, we headed into town for a tour of the White House using tickets that Sally got from our Congressman (a Republican none the less). The tour was nice but neither Bill nor Hillary were home to greet us. We took the Metro (subway) in and out of town. After that we took the National Park Service TourMobile around the town. We were able to do a Capitol Building tour - the lines were pretty short because of the heat. We also got to Arlington Cemetery and visited the Kennedy grave and the Tomb of the Unknowns. On Friday, we got to the Holocaust Museum, the Smithsonian Air and Space Museum and the National Archives. Friday evening, we visited 3 of my cousins and their families who live in the Washington area..
Saturday was my day. 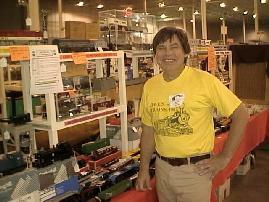 I had a train show to attend in Chantilly, VA. I wanted to meet one of the other collectors that I buy trains from. He lives in NJ but I had never met him although I have been buying trains from him for years. Turns out he was scheduled to be at this train show so I had to get there to meet him. Sally was a good sport this day as I know she was pretty bored. Anyway here is a picture of Dave Boehm. Of course, I didn't pass up this opportunity to buy more trains. Sally and I had dinner with him that evening in Reston, VA.
On Sunday, we got back to DC, this time we drove in and Sally found us a really good parking place near the National Mall and the Ronald Regan Building (her son's favorite President). We went to the Museum of American History, the FDR Memorial and tried to get to the Washington Monument but we couldn't get tickets. At the Smithsonian American History Museum, I saw a computer (a G-15) that I actually used when I was in college! On Monday we drove back to Pittsburgh with a quick stop at the Horseshoe Curve in Altoona, PA. I had never been there so it was another treat for me. While we were there, three trains went by - one on each of the two uphill tracks and one on the downhill track. I think we were pretty lucky to get such a good show. Back in Aliquippa, we had a couple of days to relax. 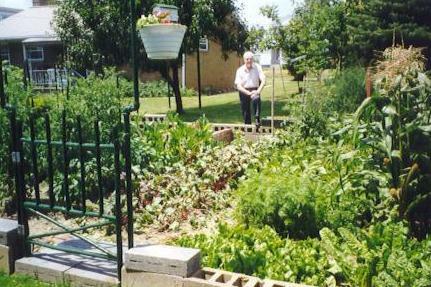 Sal got a chance to check out my Father's garden. I was also surprised at how lush it was. 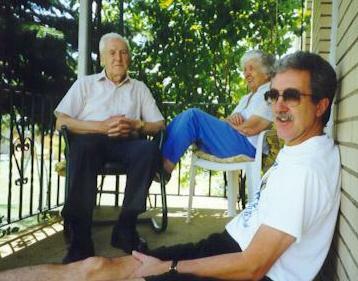 Here is my parents and me sitting on the back porch. On Thursday, we went to a flea market at my parent's church. Sally bought a few things and I bought some science fiction books. We left PA on Thursday night. Sally headed back to San Diego and I headed off to Boston for a business meeting with one of my clients. Never made it to Kennywood Park and the famous Thunderbolt Rollercoaster. Next time. 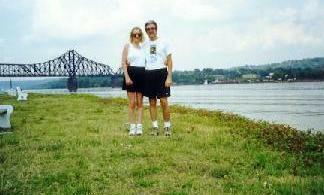 Picture of Sally and me standing next to the Ohio River in Monaca with Beaver across the river. The bridge is a railroad bridge for what used to be the Baltimore and Ohio Railroad (now CSX).